“ARVI KALAKUTAI“ established in 2004 is the only company in the Baltic states specialising in turkey slaughtering and turkey meat processing, with its produce being delivered to Lithuanian supermarkets and exported to Latvia, Estonia, Denmark, Belgium, Germany, England, Finland, Sweden, and other European countries. 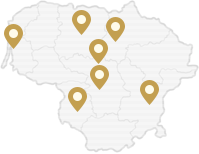 The company has its own shop network in all of Lithuania. The equipment of the Dutch company “Stork” was selected for quality production of the company. “ARVI KALAKUTAI“ processes over 7,000 tons of turkey meat annually. The company’s slaughtering and meat processing technologies are in line with the highest EU requirements. The company has implemented the HACCP programme. It has also received the EU veterinary certificate, while the BRC (British Retail Consortium) Global Standard certificate is being renewed on an annual basis. Today, the assortment comes to over 100 various turkey meat products, which regularly receive highest awards at international exhibitions. The quality of „ARVI KALAKUTAI“ turkeys is guaranteed by working with trusted partner „Ūkininko Irmanto Grigo ūkis“. Because of their unique experience in the industry they are the experts in the field of turkey growing. „Ūkininko Irmanto Grigo ūkis“ is growing and selling Deutch breed turkeys („KARTZFEHN“) BIG-6. Farms in which turkeys are grown are built and equipped in cooperation with poultry growing experts and companies from Italy („OFFICINE SPEROTTO“) and USA („BETCO“, „Chore Time“). Special computer systems installed in all farms helps to automate almost all turkey growing processes. Everyday care by the employees and natural growing environment helps us to bring you probably the healthiest turkeys. The taste of turkey meat mainly depends on what kind of feed was given to the birds. The birds grown in our farms are fed on special well-balanced feed for them that are produced by “Marijampolės pašarai“ feed factory. “Marijampolės pašarai“ factory has implemented the most modern achievements of feed producing industry, which allows us to produce high-quality, precisely balanced feed. The feed is also thermally treated to achieve better digestion and avoid diseases.